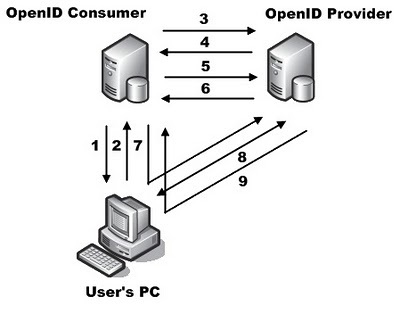 Tin Isles : How Does OpenID Work? I’ve heard about OpenID on a podcast I listen to. Sounds interesting – an open source solution to have a ‘single sign on’ for many websites. Interested to see how this works – both as a user, and as a website author. User accesses an OpenID enabled website, site responds with a form requesting the user’s OpenID identity. User enters their identity, e.g: russau.myopenid.com. Then submits the form to the website. Website POSTs an ‘associate’ request to the provider. The two machines establish a secret using a Diffie-Hellman key exchange. Provider’s response provides the website an ‘assoc_handle’ (and expiry) for future requests. The two servers now have established a shared secret, without passing it over the wire. The comsumer’s response from step 2 contains a redirect to the provider, containing a number of parameters in the querystring. Note, the querystring contains the established ‘assoc_handle’, and a ‘nonce’ has been attached onto the ‘return_to’. The user is now on the provider website, and performs the step needed to authenticate, e.g. entering a password. The provider redirects the user back to the consumer website, along with parameters in the querystring. The consumer now has everything it needs to log in the user. This querystring contains a couple of things to prevent an attacker from spoofing it. The ‘assoc_handle’ established in steps 5 and 6, the consumer uses to this look up the established secret. ‘openid.sig’ contains a digital signature of the parameter values listed in ‘openid.signed’, using the established secret. If an attacker were to change the ‘openid.identity’ in an attempt to login as someone else, the signature wouldn’t match (without knowing the secret, the attacker cannot re-create the signature). Finally, the initial ‘openid.return_to’ in step 7 contained a nonce. If an attacker were to resubmit the querystring above unchanged (a replay attack), the consumer web site would know the nonce has already been used. Posted by russ on Tuesday, February 12, 2008, at 2:05 am. Filed under security, web dev. Follow any responses to this post with its comments RSS feed. You can post a comment or trackback from your blog. Thanks a lot for the very easy to understand summary covering request and response formats. It would be great if you can elobrate the role of encryption. there's not actually any "encryption" going on here. in steps 5 & 6 the two servers establish a "shared secret" using a Diffie-Hellman key exchange. in step 9 the OpenID enabled website receives a querystring that contains a signaure using this “shared secret”. so the website server can be 100% confident the querystring has come from the same server it talked to in step 5. I should mention that with OpenID 2.0 specifications, the consumer and provider can now be the same entity, for example, Google or MySpace. And instead of end-users using a URL as an OpenID, they can click a button that says "Log in with Google" and be redirected to Google page to log in, and be redirected back to the original page logged in. This is a huge step because users don't need to set up anything different if they already have a Google, Myspace, Yahoo, etc. account.